Handmade by mothers in Haiti with a gorgeous crocheted edge and details, these baby blankets are sophisticated and meaningful. The work offers moms a steady living wage to provide for their families and break the cycle of poverty. 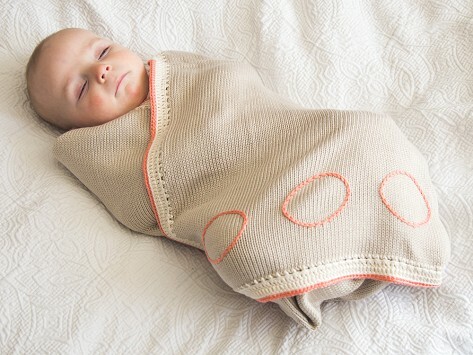 I bought 2 for my newborn---I LOVE LOVE LOVE THESE BLANKETS (and hat). They are gorgeous...soft...warm...extremely well made. I had it with me in the hospital and the photographer used it in some pictures wrapped my baby in it. Then the hearing test lady came in and loved the blanket...I told her the story of where it is made, who made it, etc etc and she screamed "I'm from Haiti!!" so it was great fun. PRICES NEED TO GO UP!